Be they Jewish, Muslim, male or female, flat tires must be changed and traffic must flow. That could be what Colonel Ahmed Abu al-Rub, chief of the Palestinian Authority's Hebron police department was thinking this past Wednesday when he found an Israel Defense Force jeep with a flat tire blocking the road. Backing up traffic on a thoroughfare near Yatta and Susiya which is frequented by both PA and Israeli residents, the colonel finally got out of the car to personally inspect the flat tire. But what was seen as a matter of practicality, by some, and a good deed by others was seen as treasonous by certain PA residents and officials. Abu al-Rub was suspended from his position after photographs of him helping the group of Israelis were posted online. Some PA residents blasted the colonel for helping "the occupation" and political cartoons mocking him were posted to Twitter and other social media. An official announcement from PA Major General Hazem Atallah stated that "Ahmad Abu al-Rub will be suspended from work and sent to an investigation committee while his deputy will be assigned to run the affairs of the governorate." 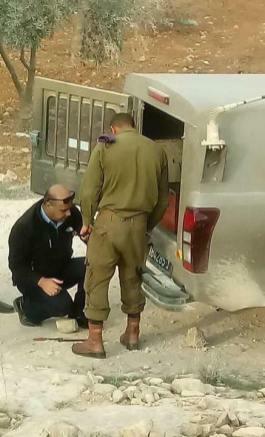 The Jerusalem Post reported PA sources stating that "at one stage, Abu al-Rub knelt down to check the problem with the vehicle. He did not fix the tire of the vehicle." The city of Hebron is divided into Israeli and PA sections with the PA having its own governmental jurisdiction and police force. PA security teams often work together with the IDF throughout Judea and Samaria, which is divided into Areas A, B and C -- PA control, Israeli control and joint jurisdiction. All major Arab population centers are under PA control. In Jewish communities of Judea and Samaria, Israel is the governing body. In Hebron, the rare tours of Jewish holy sites located in PA controlled areas are conducted in coordination between the two. On holidays such as Ramadan, medical and security personnel from both jurisdictions coordinate the influx of large crowds. The joint coordination is in line with both the Oslo Accords of 1993 which created the PA and the Hebron Accords of 1997 which divided the city. Israeli security and medical personnel in Hebron have also helped PA residents in medical emergencies. Whether or not Abu al-Rub actually fixed the flat tire, or whether his motivation was out of self interest or humanitarianism we may never know. But what it does highlight is the complicated relationship between Jews and Muslims in the greater Hebron region which sees a mix of both normal daily human interactions and violent terrorist attacks. There is a fear in the Arab community of being seen as a collaborator with Israel. Arabs who have sold real estate to Israelis have been sentenced to death as was the case of Muhammad Abu Shahala in Hebron. The flat tire incident also brings up the issue of whether the majority of average PA residents truly hate Jews or whether it is just the leadership which holds a tight grasp on controlling public sentiment.